movies 2013 | Cappa Toons! 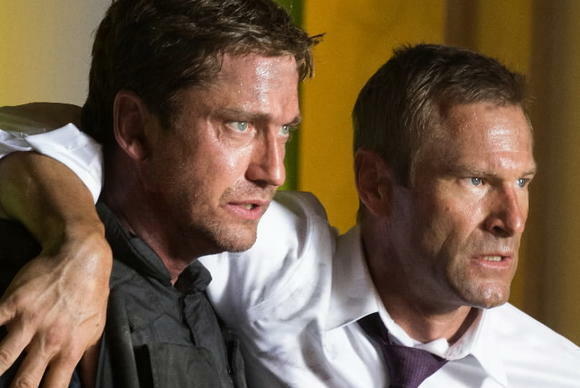 Olympus Has Fallen is pretty much in the category of what I like to refer to as the scripted thriller. I use the term scripted because that’s pretty much what the movie feels like, where none of the dialogue comes out naturally or sounds like how people actually talk in real life. Instead, all the dialogue is on the nose. All aspects of the script are categorized: this is the funny moment, the serious drama moment, the action moment, the quirky silly moment, etc. I similarly remember this feeling when I saw the film Patriot Games, starring Harrison Ford, another example of a film where the script is boiled down into a typical cliche Hollywood formula script. Olympus Has Fallen has been referred by most people as “Die Hard in the White House”, except this movie is what happens when you take a script like Die Hard and yank out all the personality, all of the fun things that make the characters who they are, and take away any and all consequences that would give you any reason to care about what’s happening on the screen. I pretty much knew what I was in for after watching the first two minutes of the films Camp David scenes. The one thing I had expected by then was that the film was going to play it safe all the way through. 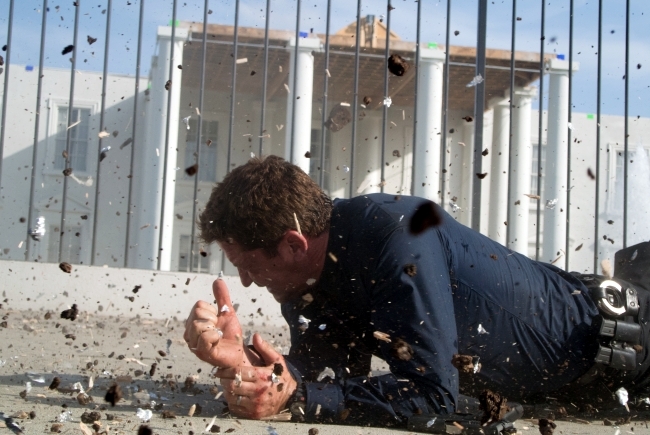 In the opening sequence, the first lady is killed in a freak car accident, which puts a lot of guilt on secret service agent Mike Benning (Gerard Butler), who is is close friends with the President (Aaron Eckhart), and Mike essentially is retired to an office position after his failure to rescue the first lady. The personality of the characters is all pretty much one note. Everyone walks through their role with no changes in their personality. Nothing about them is really tested based on the events of the film. Later in the main story, the White House is taken over by Korean terrorists, and the villain Kang, who is the leader of the operation, is absolutely all business. Seriously, you don’t get a hint of what this guy feels outside of being the straight laced villain. Unlike say Hans Gruber from Die Hard, who was not only devious, but he actually had a kind of sense of humor, and on top of that he was an expert at manipulating everyone in sight. We get none of that sense of fun out of Kang. As for Mike Benning, who is in the John McClaine role as the lone, ex secret service agent who has to save the White House. Apart from the chance of getting his job back as a secret service agent through this ordeal, Benning never has anything serious at stake. His journey through the film plays out like fulfilling objectives in a video game. Save the presidents son. Check. Take out mole secret agent. Check. Take out the villain and save the president. Check. The problem here is that everything Mike accomplishes never comes with any consequences. For instance, Mike manages to go in and save the presidents son. Okay. But what does saving his son say about him as a character? If it’s just going to play out and the kid just manages to be rescued, how is that going to affect anyone in the film? The answer is, it doesn’t. The kid is saved without anyone (apart from the terrorists) falling victim to serious harm. What if Mike failed to save the first kid after already failing to save the first lady? The question is never really brought up. When the kid is saved, Mike simply moves on to the next objective. All the while we’re never given any reason as to what all of this means to anyone. The agent (Dylan McDermontt) who goes rogue…what’s his motivation for turning against the president apart from not liking his political strategies? The film never says. Even when Mike gets him to “do the right thing” and tell Kang that Mike is dead, we never know what the purpose of this was or how the relationship affects the film. Because about 10 minutes later, Mike just arbitrarily reveals to Kang that he’s alive. So what was the point of trying to hide himself? The other thing I want to point out is the president, played by Eckhart, who comes off to me as a man who has absolutely no faith in himself or the universe. There’s this funny line that’s always said in movies like this: “The United States doesn’t negotiate with terrorists.” Yet negotiating almost always happens in these movies! The president tries to save his cabinet members by ordering them to give the destruct codes for the nuclear missles to the terrorists. Umm….why would you do that? His cabinet members are prepared to die to save the United States. They know what they’ve signed up for. In a real life scenario, the terrorists would have his cabinet members killed anyway after they got the launch codes. The point is even made…if the terrorists actually killed these people, they lose getting the launch codes. So what if they have to endure pain, I think its worth it to keep millions of American lives safe. 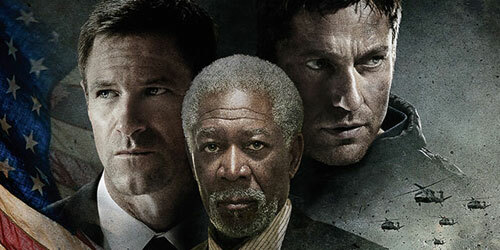 As for Morgan Freeman…well…unfortunately he’s given nothing interesting to do in this film. He steps in as House Speaker to be acting president (although I can’t recall where the vice president is during all this), but he pretty much does his job without any crucial problems getting in the way, apart from reacting to terrorists destroying the United States. I also think, regarding the first lady, the reason she’s killed in the beginning is simply to write her out of the script. The script makes it sound like the characters are going to be impacted, but her death never resolves anything except to set up a reason for Mike to lose his job and then work to get it back again by the end of the movie. Really, she’s killed just to be one less body the writers wanted to focus on, and instead the focus is shifted to saving the presidents son. Mike’s wife, who is a nurse at a hospital, also has nothing to contribute to the film except cutting back to her once in awhile for him to “check in” with her. The terrorists bluff about knowing about his wife and threatening to get her, but they make no attempt to kidnap her or cause her any real harm. So is there anything especially good about Olympus Has Fallen? Well, the 20 minute action take out of The White House is entertaining, but again, because we have no real emotional investment in the characters, the action sequences are all spectacle. I found some of it even filmed in confuse-o-vision, making it difficult to track whose killing who. I’d also forgot occasionally about certain characters that were supposed to be important, but we’re given nothing out of their personalities to latch on to or hold our interest. The film overall could be regarded as stupid fun, but even the problem with that is that the best films that are dumb actually acknowledge themselves as being silly. In the case of this film, it tries to play everything seriously, and it just doesn’t work. The characters make so many dumb decisions throughout the movie that we can’t really take what’s happening with any sense of reality. So in a nutshell, you can pass on Olympus Has Fallen. The script just doesn’t play with any sense of believability, including the dialogue, with which nobody talks to each other like normal human beings. It’s simply a mediocre outing.